You know when you meet people and pretty much immediately know you’ll be best friends? That’s how I felt from Alexandra and David’s initial email about their engagement session. Once I learned more about them, my thoughts were solidified even more! These two are fellow vagabonds, living on the road full time, but instead of just the western US like us, they travel the world! They have traveled and run their animation marketing business from Australia, a camper van in New Zealand, Southeast sia, Italy, China, and Paris in the past year! They were engaged over the tree-tops in Bali and managed to keep it a secret for three whole months! They loved the thrill and romance of the secret, and even made this adorable announcement video to tell their families when they got home to California! 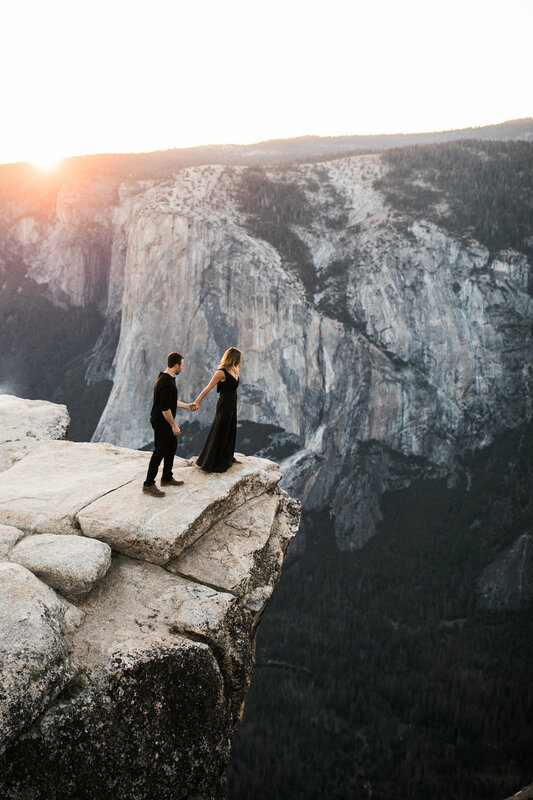 They are videographers as well, and love to do landscape photography while they’re traveling, and they often take tripod photos of themselves so they were really psyched to meet up with us in Yosemite for their engagement photos! We met up with them in the parking lot and hiked out to Taft Point together, stopping along the way for some photos in the enchanted forest with giant moss-covered trees and ferns all over the ground. Just before getting to the overlook, they changed into gorgeous all-black outfits and we hiked out to the overlook to watched the sunset! We have been to Taft Point probably 50+ times, but my goodness it just never gets old. Yosemite Valley is so gorgeous, and getting to see it from high above every other feature is such treat, plus getting to introduce new people to this amazing spot is one of the best things on earth! Alexandra and David loved watching the sunset together and soaking in the views. After the sun went down and the light was nearly gone, we hiked back by moonlight and headlamps through the woods to the cars. When it was all over we didn’t want to go! It was so fun hanging out with these two, I definitely think we’ll get together again in the future.